Get kids building exciting computer projects, including games, music, and designs. Perfect for children ages 7-11 who are new to programming, this highly visual workbook is a fun introduction to Raspberry Pi, an affordable credit-card-size computer that is revolutionizing the world of computing and can help boost kids' computer skills in a new and innovative way. 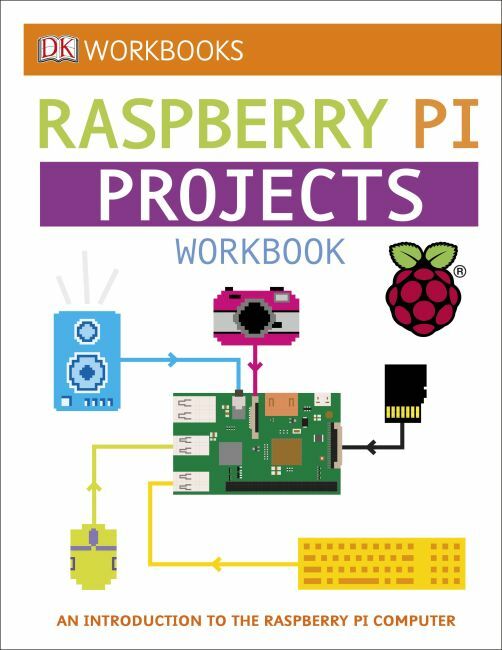 With easy-to-follow directions and fun pixel art, DK Workbooks: Raspberry Pi Projects helps kids understand the basics of computers, programming, and how to create cool projects in Scratch, Python, and Sonic Pi through fun, hands-on learning experiences. All they need is a Raspberry Pi computer, an SD card, an HDMI cable, a USB power supply, and a standard monitor, mouse, and keyboard. After they learn how to program their Raspberry Pi, kids can make their own music using Sonic Pi, craft amazing designs using Python, and build and play their own computer games and projects with Scratch. They can even test their coding knowledge with written vocabulary and programming quizzes at the end of each project.